I am so sorry. At least I kept it out of the post title. 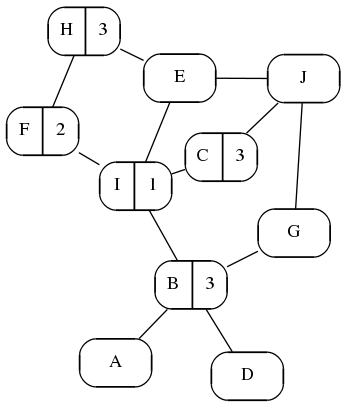 Yesterday I created a basic adventure structure, ten nodes (places of interest, basically) all linked up. Now I need to put something in them. Time to break out the tools of imagination. Sometimes it might be the Tome of Adventure Design (huh, I’ve mentioned it many times on this blog but still haven’t gotten around to a review… I’ll get to it someday), but this time I’ll use Scenes of Chance from Twizz Entertainment. Sadly, I can’t seem to find a link to purchase these, so if you missed out on the Kickstarters you might be out of luck. A graveyard with a large tree (icons: forest, NPC, weather, lore). A river (or long skinny lake) winding between mountains (icons: mountain, mountain, water, weather; danger, lore). A swamp near a break in a cliff (icons: swamp, NPC, ongoing event, weather). A great gate or door flanked by flaming torches (icons: castle, dungeon, NPC; lore). A swamp full of gnarly trees and little light (icons: swamp, feature, weather). A catacomb (icons: dungeon, dungeon, dungeon; danger). A cave full of pillars (icons: cave, oddities, ongoing event; lore). A town (icons: NPC, ongoing event, weather; reward). A watery cave with a waterfall just outside (icons: cave, water, water, weather). A view from within the forest toward a castle (icons: castle, forest, NPC, weather; danger). Some of these already give me some ideas, but Scenes of Chance provides some useful little tables that can be used to expand on the meaning of the icons. However, first I’ll attach some labels to the nodes in the diagram. The original diagram is below, for reference. Now, I’ll assign the Scenes to the nodes. First in a table for clarity, then an updated diagram. A Great Gate Castle, Dungeon, NPC; Lore This is the actual castle. B Forest/Castle Castle, Forest, NPC, Weather; Danger Leading up to the castle. C Mountain River Mountain, Mountain, Water, Weather; Danger, Lore River leads past castle. D Catacomb Dungeon, Dungeon, Dungeon; Danger Secret way from graveyard to castle. E Cave Cave, Oddities, Ongoing Event; Lore Caves outside town. F Dark Swamp Swamp, Feature, Weather Further downstream from the swamp; wetter, more shadowy. G Graveyard Forest, NPC, Weather; Lore Just outside town, near the forest. H Cave-Waterfall Cave, Water, Water, Weather Down by the sea, obviously. I Swamp Swamp, NPC, Ongoing Event, Weather Wetlands below the forest. J Town NPC, Ongoing Event, Weather; Reward Where the PCs start, a bit higher ground than the swamp but not on the river. I wanted the town to connect to a little bit more, and not being on the water seemed wrong so I linked it to the swamp (it’s not great water, but it’s something). There were a few other little changes. The original graph is sometimes just a starting point. Also, the layout engine I use for the diagram moves things around a bit according to its layout rules. These rules usually lead to sensible outcomes. The diagram below shows the links between the nodes, but isn’t arranged quite how I would expect it to look geographically… but that’s okay, I get to explain it all in the next post. This is fascinating to me. As a gamer who never led a campaign, It’s fun to see all the work that goes into it!